Excel is more than a data entry tool. But if you only talk about data entry in Excel, it’s a damn good one. 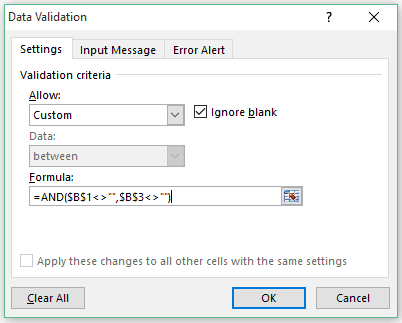 Using the data validation, you can enable data entry in cell(s) based on a predefined condition. Allow data entry from a pre-defined list only (using drop-down lists). Allow data entry only when the specified cell(s) are filled. Allow DATE entry between two specified dates only. You can also combine multiple conditions to create a data entry rule. 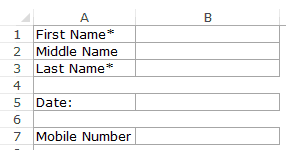 This type of conditional data entry in excel can be done using the data validation feature in Excel. 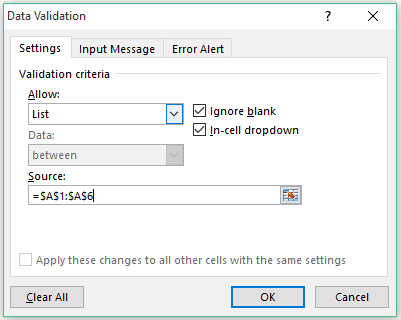 It can enable data entry in the specified cells only when the specified conditions are met, else it shows an error. Select the cell where you want to show the drop down list. In this example, it is cells C1. Source: $A$1:$A$6 (you can use the range where you have the data). Ignore Blank: Checked (uncheck this if you don’t want the user to enter blank). In-cell dropdown: Checked (this would enable the drop down feature). This will create a drop-down list in the selected cell. Now you can either select them from the drop-down list, or manually enter the data in it. If you enter any data that is not from the source data, it will show an error. 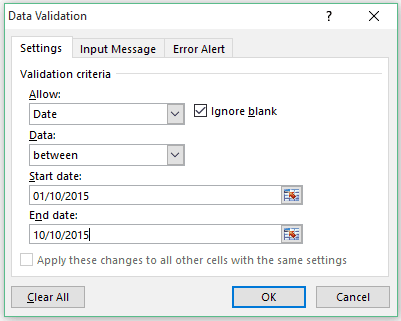 CAUTION: If you copy and paste over the cell which has the data validation rules, the data validation rules disappear. This could be the case when you want the user to go in a sequence and complete filling a form/questionnaire/survey. Select the cell where you want to apply this condition. In the above example, it is cell B5. Ignore Blank: Unchecked (make sure this is unchecked else it will not work). In this case, we have used an AND function that checks whether both B1 and B3 have already been filled. If not, then it shows an error. There is an inbuilt feature in data validation that will let you do this. You can specify the upper and lower date limits, and if the user enters a date which is outside of this range, he/she will get an error. Start Date: Enter the start date here (any date that is before this date will not be accepted). End Date: Enter the end date here (any date that is after this date will not be accepted). You can also use a cell reference or a formula to specify the date. For example, you can use TODAY() function as one of the date limits (if you want the lower limit to the current date). Since Excel stores the dates as numbers, you can also use numbers instead of dates. For example, instead of using 01-01-2015, you can also use the number 42005. First Name and the Last have already been filled by the user. The entered date is between 01-01-2015 and 10-10-2015. 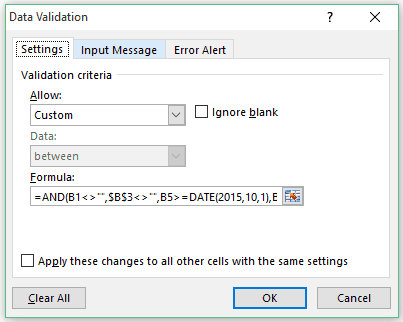 This formula checks for four conditions – whether the two cells (B1 and B3 are already filled, and whether the date entered in cell B5 is within the specified date range). Similarly, you can create and test for multiple conditions while allowing data entry in Excel. Using Drop-down Lists in Excel. 100+ Excel Interview Questions and Answers.